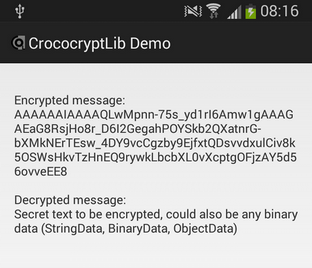 CrococryptLib 1.4 for Android released: A library for mobile apps that allows the most easiest integration of password-based encryption, hashes and other cryptography operations. No in-depth cryptography knowledge is required to integrate encryption into Android apps. One of the main features of CrococryptLib is the automatic generation of secure crypto parameters and saving them in a single compact format. There is no additional overhead for your application but one single property. If you do not want to deal with questions like key sizes, salt lengths, block cipher modes, initialization vectors or iteration count then CrococryptLib is exactly what you need for your software project. The defaults automatically used by CrococryptLib are PBKDF2 (PKCS #5) and SHA512 for password hashes and AES 256 Bit in CBC mode for symmetric encryption. Moreover, CrococryptLib integrates various encoding options that you can choose from. You can decide what is best for your application context: binary, Base64, JSON. Moreover, CrococryptLib supports large data streams and files as well. These features allow Android developers to easily use encryption within their apps for files, the built-in SQLite database, Web services etc. For more information go to the CrococryptLib Homepage: Easy Java encryption.